Astrochemistry and Astrobiology is a very comprehensive work, covering all the main topics in astrobiology and astrochemistry, showing and explaining the links between the two subjects. The text is clear and easy to follow, even for who have only a rough idea about the topics treated in it. The authors follow a top-down approach, going from general concepts in astrochemistry, like the distribution of organic compounds in space or extrasolar planet identification, star formation and stellar chemical reactions, to a deeper and more complex evaluation of the phenomenon of life and all the mechanisms that have ensured the development of living forms on an habitable planet. This top down approach is balanced by a bottom-up description that leads to increase the complexity of the book; those subjects include important evaluation of the chemicals used by life, like water, carbon and energy, and why life uses these. Biological topics such as proteins, DNA, lipids and metabolism are also taken into account. The text easily gives a general and complete overview of those topics, maintaining a medium detail level side-by-side with a basic scientific language that uses digression, reflection points and detailed description of the criteria taken in consideration, allowing the text to be read by almost everyone. The authors can easily correlate and evaluate in detail all the different parts, giving strong connection points and deep insights, while keeping a high scientific level by referring to a large recent literature of scientific papers. The book is easy and pleasant to read in full without losing view of the main topic (indeed the authors have succeeded in creating a straight line from all those different parts of the manuscript), and as astrobiology and astrochemistry are multidisciplinary subjects it is still possible to fully understand this book if the reader only possesses a basic knowledge in chemistry, biology and astronomy. Overall, Astrochemistry and Astrobiology provides the reader a full introduction to the main discussion points in astrobiology and astrochemistry, giving all the necessary basis for further and more in-depth studies. Short and easy to read, this book is good for students with an interest in expanding their knowledge about the physio-chemical basis of life (as we know it) in the universe and the mechanisms and characteristics that has ensured life to appear, maintain itself and develop. 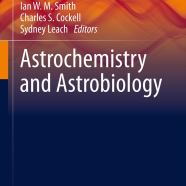 Astrochemistry and Astrobiology is published by Springer. More information is available here.